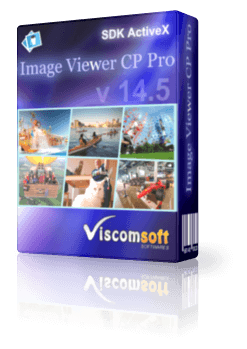 For Windows Developers who need to PDF TIFF Viewer and Image Viewer , plus support TIFF with WANG Annotations, securing a PDF document, add annotation with PDF for C++ , C#, VB.NET , VB, Delphi, Vfp, MS Access. View and printing PDF, Fax documents, MNG, Raw Image ( cr2, nef , crw, mrw, raf, erf, 3fr, dcr, raw, dng, pef, x3f, arw, sr2, mef, prf), BMP, GIF, ICO, JPEG, JPEG 2000, PCX, PNG, PSD, TIF, WMF, WBMP, TGA, PGX, RAS, PNM image files. 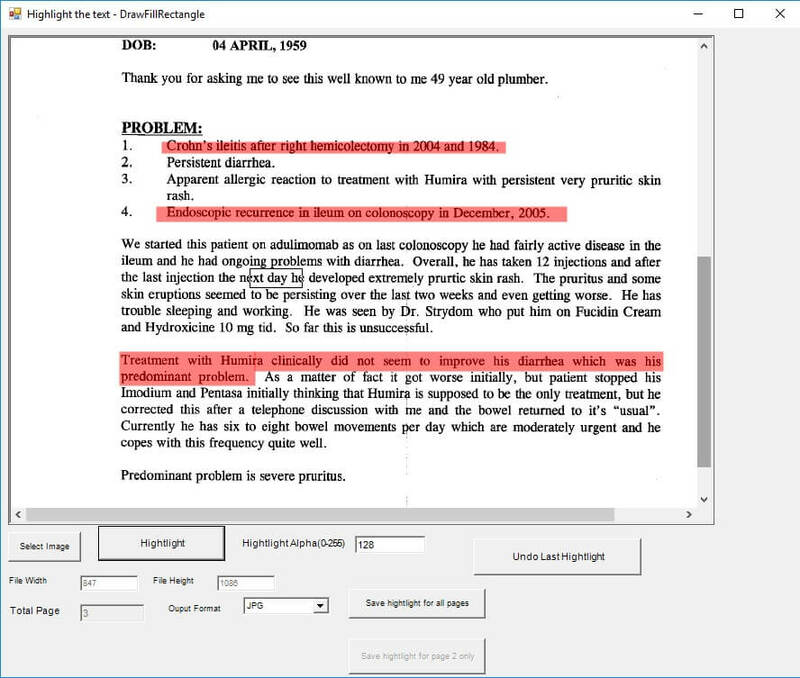 Support PDF Annotation when save to PDF/A file, add fonts, draw images, draw text, rotated text , ellipses, lines, rectangles to PDF file. 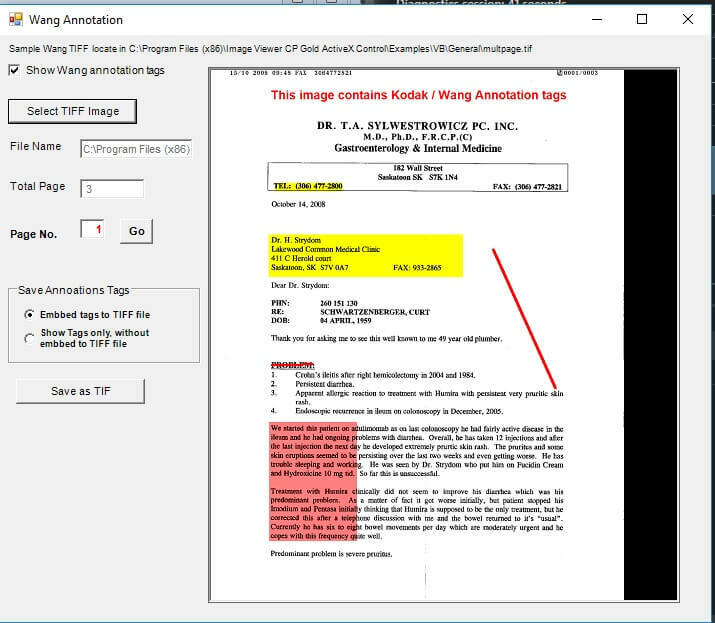 Support add PDF Annotation when output searchable PDF file. Support save to PDF with JPEG compression or ZIP compression. Support extract text from multipage PDF file. Support read Photoshop PSD file and read each layer information, e.g. layer name, layer image size , export the layer to transparent PNG file. Support checking whether blank page and get the confidence value of page. Support render password protected PDF document. need add-ons DICOM Module support display monochrome, grayscale, palletized and true color DICOM images. need add-ons DICOM Module support reads a specified frame in a multi-framed DICOM image. need add-ons DICOM Module support playback all frames in a multi-framed DICOM image. need add-ons DICOM Module support read all patient metadata from DICOM images. need add-ons Barcode Reader Module read 1D and 2D barcodes in images. Supported UPC-A, UPC-E, EAN-8, EAN-13, Code 39, Code 93, Code 128, ITF, Codabar, MSI, RSS-14 (all variants), QR Code, Data Matrix, Aztec and PDF-417. Automatic barcode type detection, Read multiple barcodes at any orientation. High-speed barcode recognition and return sureness value of each detected barcode. need add-ons Barcode Writer Module support write QR Barcode to image files or HBITMAP, custom define background, foreground color, version number, error level and border size. need add-ons Barcode Writer Module supported output Codabar, Codec 11, Code128A, Code128B, Code128C, Codec 3 of 9, Industrial 2 from 5, Interleave 2 from 5, Matrix 2 from 5, Code 128, EAN 8, EAN 13, Plessey, UPC-A, UPC-E Barcode. need add-ons Barcode Writer Module supported Writes barcodes to image file or HBITMAP handle, Preview Barcode on Screen, Set the bounding rectangle of barcodes, Supports check digits for barcodes that use them, Supports visible or invisible the barcode value. Allow use Asynchronous Mode or Blocking Mode for OCRStartScan method. Convert PDF, MNG, Raw Image ( cr2, nef , crw, mrw, raf, erf, 3fr, dcr, raw, dng, pef, x3f, arw, sr2, mef, prf), BMP, GIF, ICO, JPEG, JPEG 2000, PCX, PNG, PSD, TIF, WMF, WBMP, TGA, PGX, RAS, PNM image files to PDF file. Convert multipage PDF, TIFF to single, multipage PDF. Powerful zoom in, zoom out, panning, auto zoom and auto scrolling when drawing the selection rectangle. 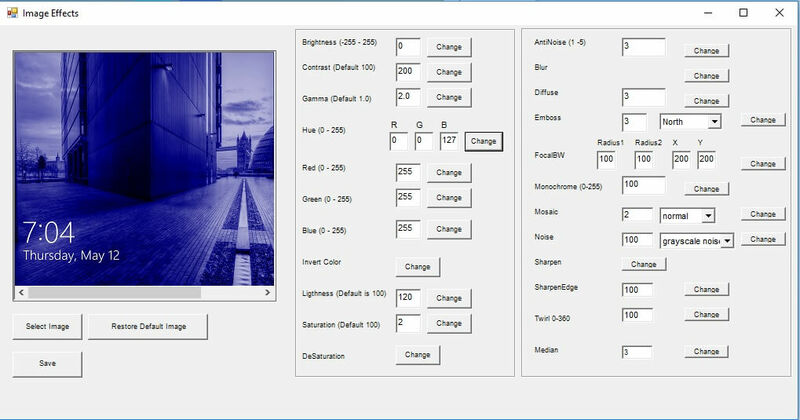 Convert images from any color resolution to any other color resolution (1 bit, 4 bit, 8 bit, 8 bit grayscale, 16 bit, 24 bit, 32 bit). Support rotate Multipage TIFF or PDF file. 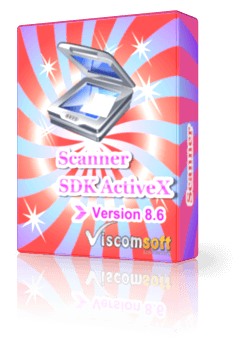 Support save as BMP, GIF, ICO, JP2, JPC, JPEG, PCX, PDF,PGX, PNG, PNM, RAS, TGA, TIF, WBMP. Very smooth scrolling when display big image file. Create thumbnail image from BMP, GIF, ICO, JPEG, JPEG 2000, PCX, PNG, PSD, TIF, WMF, WBMP, TGA, PGX, RAS, PNM image files. Support Capture image from URL. Support load image from IStream. 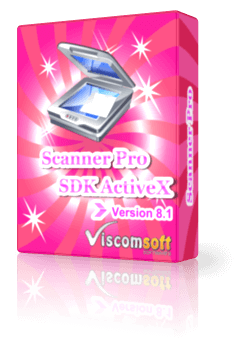 Supports the following adjustments and effects: Lightness, Brightness, Contrast, Diffuse, Emboss, FocalBW, Gamma, InvertColor, Monochrome, Noise, SharpenEdge adjustment, AntiNoise and more effects. Support save as multipage TIFF images ( Packbits, LZW, CCITT G.3 and G.4). 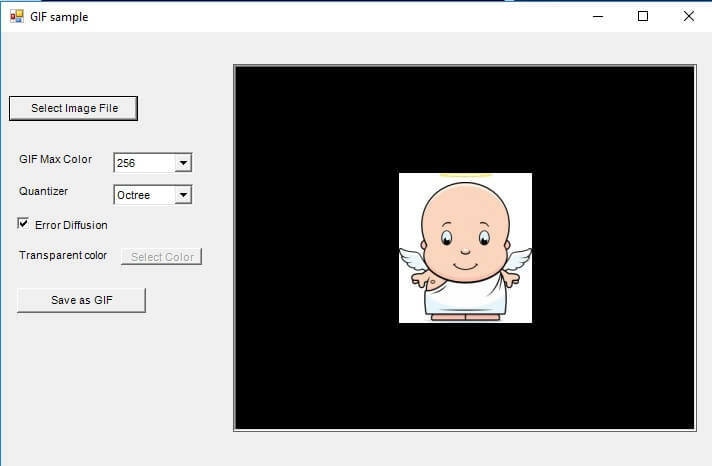 Create multipage TIFF images from BMP, GIF, JPG, PNG, ICO, TIF Files. Advanced multi-page printing, including Print more than one image on the same page, Print a range of pages from a multi-page file, Print multi-page images in single print jobs, Stretch an image to fit the printed page. Draw multiline text on image and provide over 50 different text styles and watermark style. Draw overlay image with watermark style and adjust transparent color. Merge two image files and adjust watermark style and transparent color. Read, write EXIF image information.Including TIFF tags, GPS tags. Add Photo Border to an image. Has ability to drag scroll, mark a selection, crop, zoom in , zoom out on selection image. Read, write binary data types for storage of images embedded in the database table. e.g. Access, SQL Server, Oracle, MySQL. Import Image From PictureBox, Clipboard. Export Image to HBITMAP, PictureBox, Clipboard. Resize image resolution to specific size and export to JPEG, BMP, TIFF, GIF, PNG file formats. Allow you print the image to printer. Has ability to rotate,flip and zoom the image easily. Able to support loading Multi-Page Image File(TIF). Provide a value-added function called \"Map System helper\", which help you to develop an application that involved with electronic map creation or map-related function. Support keyboard or mouse wheel scrolling image. Include C#2015 C#2010, VB.Net 2015 VB.NET 2010, Visual Basic, Visual Basic Script (vbs), Visual C , Visual Foxpro, Delphi, Access, Web Page Sample Code. Fixed When calling OCRStartScan() or OCR2SearchableMultipagePDF() OCR2SearchablePDF(), if the region you have selected the zone using OCRSetRect() is a blank area with no text, it have crash issue. fixed when call FileName property to loading the pdf file that does not existing, then call LoadMultiPage method, it will crash issue. improved the barcode recognition. when set BarCodeReadScanAccuracy= true, it will get better recognition result. added MS Access 2016 General, Barcode reader, OCRPDF samples. updated VB6, VB.NET 2010, VB.NET 2015 Barcode reader samples. Now it can draw text, image, rectangles, lines at exact position of the actual pdf. Updated coordinate parameters to Centimeters unit for PDFDrawImage, PDFDrawText, PDFDrawTextAlign, PDFDrawLine, PDFDrawFillRectangle, PDFDrawRectangle methods. e.g. you may draw the text at 3 cm x 8 cm on PDF. added PDFGetPageSize method, It can get the specific PDF Page size in Centimeters unit. updated PDFDrawText, PDFDrawTextAlign methods, it can draw the text over rectangles, lines, filledrectangles etc. added PDFDrawEllipse, PDFDrawFillEllipse methods, it can draw Ellipse or Filled Ellipse on PDF. fixed PDFEditAddWatermarkText1 method , if the text aligning to the bottom, but half of the text goes down from the page. updated PDFEditAddWatermarkImage, PDFEditAddWatermarkText2 methods , now coordinate parameters is Centimeters unit. updated VB6, VB.NET 2010, VB.NET 2015, C# 2010, C# 2015 \'s PDFAnnotation and PDFEdit Samples. 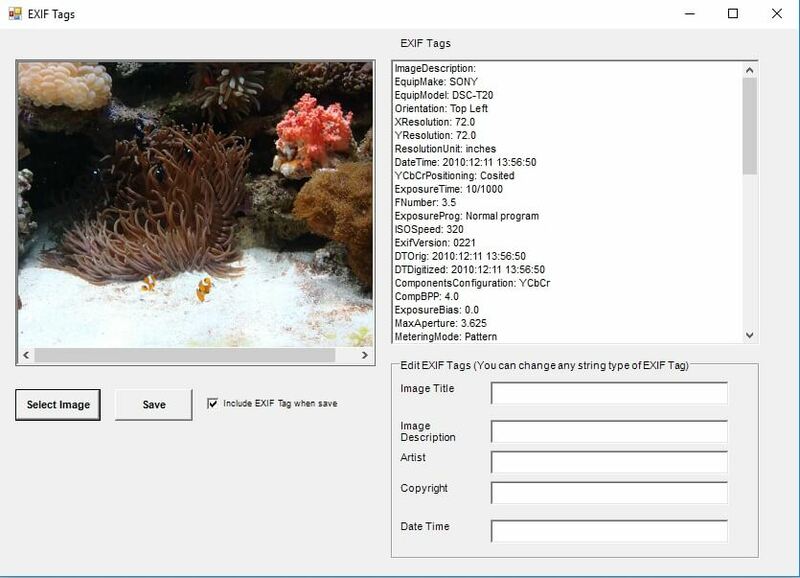 added PDFEditAddWatermarkImage, PDFEditAddWatermarkLines, PDFEditAddWatermarkText1, PDFEditAddWatermarkText2, PDFEditEncrypt, PDFEditImageExtract methods. updated VB6, VB.NET 2010, VB.NET 2015 PDFEdit samples. updated VB6, VB.NET 2010, VB.NET 2015, C# 2010, C# 2015, VFP BarcodeReader samples. added support output searchable PDF file with PDF annotations in same time. Now you may call OCR2SearchableMultipagePDF or OCR2SearchablePDF method and add images, draw text, rotated text, lines, rectangle to PDF file in same time. updated VB6, VB.NET 2010, C# 2010, VFP OCRPDF samples. fixed load TIF file cannot add PDF Annotation issue. added support allow use JPEG compression when save to PDF file. It valid for Save, SaveBySize, Image2PDF, CreateThumbnail methods. It can reduce PDF document size. added support output OCR to Unicode Searchable PDF/A. added support set Unicode to PDFAuthor, PDFCreator, PDFProducer, PDFTitle, PDFSubject, PDFKeyword when save to PDF/A file. updated PDFUseJPEGCompression and PDFJPEGQuality properties that support Save, SaveBySize, Image2PDF, CreateThumbnail methods. updated VB6, C# 2010, C#2015, VB.NET 2010, VB.NET 2015 samples. fixed LoadFromByteArray method on 64 bit OS issue. fixed loading TIFF file , draw the overlay image, then print to printer. The overlay image disapper issue. fixed cannot print large TIFF file issue. fixed load PDF file , then save to PDF file, the page size or resolution have not keep original size issue. changed Barcode writer plugin that include 1D Barcode writer and QR Barcode writer now. updated VB6, VB.NET 2010, C#2010, VFP Barcode reader samples. save or print to TIF or PDF file failed issue. fixed when load multipage document, go to certain page to call DrawFillRectangle, DrawArc, DrawBezier, DrawEllipse, DrawFillEllipse, DrawFillPie, DrawLine, DrawPie, DrawRectangle, DrawTexturedLine and save to TIFF or PDF file. The saved not correctly, none of these format saved. added support Pre-processing Searchable PDF (For these feature, you need purchased OCR plugin). 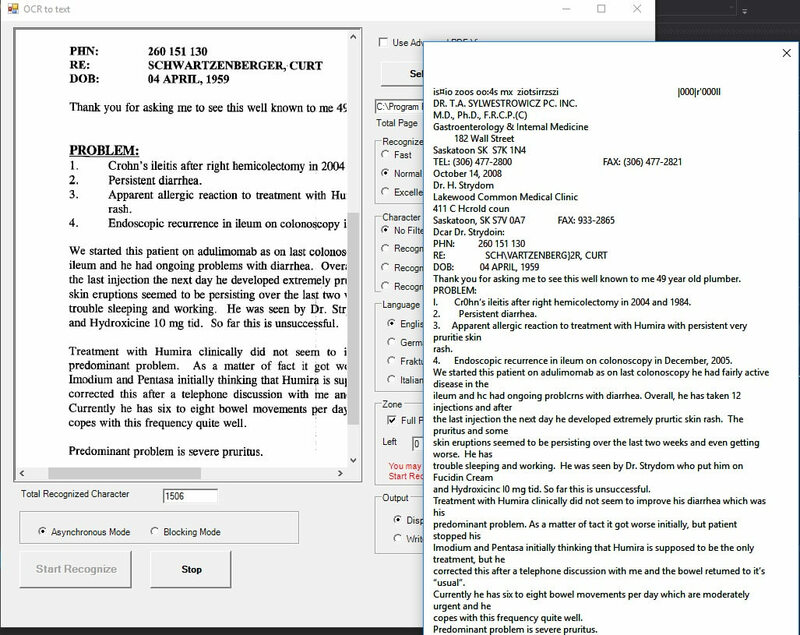 In past you call OCR2SearchableMultipagePDF, it will directly output searchable PDF file, you have not chance to add , delete or edit the recognized text. Now it added OCR2SearchableTextFile and OCRTextFile2SearchablePDF methods and OCRPDFATextFile event , let you output searchable PDF text file. you have chance change the text before output searchable PDF.You may let the text of Searchable PDF file more accuracy or add hidden text on searchable PDF file. fixed when load multipage document, go to certain page to call DrawText and save to TIFF or PDF file. DrawText it doesn’t save all the Drawtext on one page, it only save the last DrawText. Now it support multiple DrawText , Each DrawText should has its own setting(TextAlpha, TextColor, TextFontName, TextFontStyle, TextStyle) . fixed when load multipage document, go to certain page to call DrawImage and save to TIFF or PDF file. DrawImage it doesn’t save all the DrawImage on one page, it only save the last DrawImage. Now it support multiple DrawImage , Each DrawImage should has its own setting . added AutoZoom method, now you may call DrawSelectionRect, then call AutoZoom, It will auto zoom selection rectangle area. added LoadImageFromURLCompleted event, now you may call LoadImageFromURL , It will fired LoadImageFromURLCompleted event when image loaded. added ClearDrawArcByIndex, ClearDrawBezierByIndex, ClearDrawEllipseByIndex, ClearDrawFillEllipseByIndex, ClearDrawFillPieByIndex, ClearDrawImageByIndex, ClearDrawLineByIndex, ClearDrawPieByIndex, ClearDrawRectangleByIndex, ClearDrawTextByIndex, ClearDrawTexturedLineByIndex methods.Support clear specific index of DrawXXX call. added GetCountDrawFillRectangle, GetCountDrawArc, GetCountDrawBezier, GetCountDrawEllipse, GetCountDrawFillEllipse, GetCountDrawFillPie, GetCountDrawImage,GetCountDrawLine, GetCountDrawPie, GetCountDrawRectangle, GetCountDrawText, GetCountDrawTexturedLine methods. Support get the count of specific of DrawXXX call. fixed OCR2SearchableMultipagePDF bugs when call Crop method. fixed use TIFCompression and then call OCR2SearchableMultipagePDF or OCR2SearchablePDF crash issue. 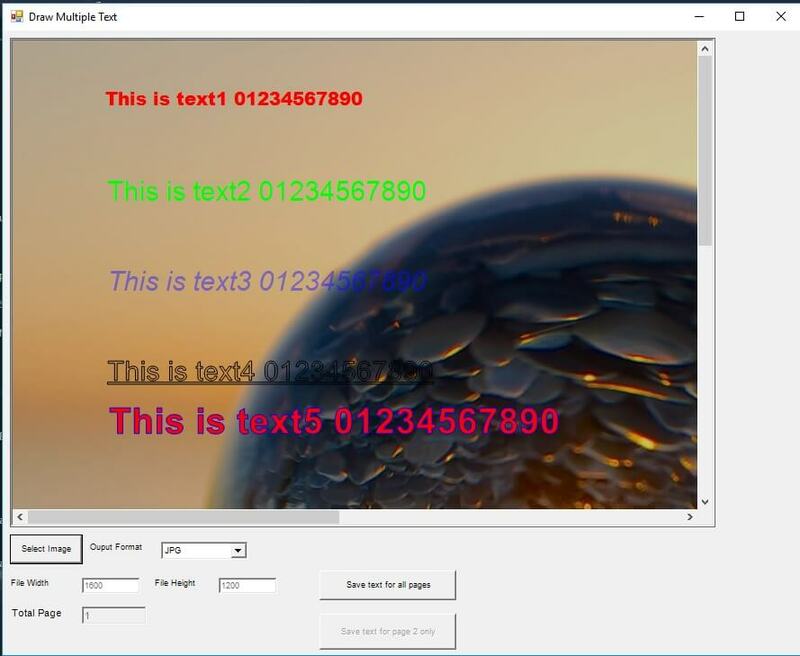 added vb6, vb.net2010, c#2010 Draw Multiple Text, Highlight the Text, Pre-processing Searchable PDF samples. each opened pdf’s file handle locked issue. improved when center the image ( View=12 ), now it can zoom in , zoom out, rotate, flip vertical or flip horizontal. added Advanced PDF Viewer and PDF Edit plug-in, it support displaying PDF file faster, displaying better quality and support more PDF files. Supported Merge PDF files, Split a multi-page PDF File, Add the PDF File to specific position of existing PDF File, Delete Page of PDF file and Crop specific part of PDF file. fixed displaying some JPEG file crash issue. updated Barcode reader, fixed cannot detect some Code 128 barcode. added PDFEditAddPage, PDFEditCrop, PDFEditDeletePage, PDFEditGetFileInfo,PDFEditMerge,PDFEditMerge methods. added vb6, c#2010, vb2010 PDFEdit samples. added support convert PDF, TIF to single or multi-page Microsoft Word (.docx) File. added support create Microsoft Word (.docx) File and add images and texts to specific page. improved conversion speed of multi-pages TIFF to PDF/A, faster than old version 8-10 times when call save method or Image2PDF method . added DocxAddChar, DocxAddImage, DocxCreateFile, DocxPDF2Docx,DocxTIFF2Docx methods. added vb6, vb.net 2010, c#2010\'s convert TIFF/PDF to docx, create docx samples. added RefreshAfterLoadImage property, it allow enable/disable refresh the screen after called FileName property or LoadMultiPage method. It can improve flickering. fixed TIFF decoder issue when load TIFF multipage file, the page refresh not correct. added support read Photoshop PSD file and read each layer information, e.g. layer name, layer image size , opacity value and allow export specific layer to transparent PNG file. fixed sometime cannot output PDF/A file when set PDFUseJPEGCompression= true. added allow use Asynchronous Mode when call OCR2SearchableMultipagePDF, it will not blocking the UI, it will fire OCRPDFA event when recognition process. added PSDGetLayerCount, PSDGetLayerHeight, PSDGetLayerLeft, PSDGetLayerName, PSDGetLayerOpacity,PSDGetLayerTop, PSDGetLayerWidth,PSDShowLayerImage methods. added vb6, vb.net PSD layer sample. updated delphi, vb6, vb.net, c#, vfp OCR to searchable PDF sample. added support search the text in your PDF. Matches to your search terms will be highlighted or draw the rectangle. Custom define highlighted or rectangle color. fixed view the fax documents (TIFF) that display wrong aspect ratio issue. fixed wrong aspect ratio issue for Save, Image2PDF, PrintImage, PrintImage2Printer, OCR2SearchablePDF, OCR2SearchableMultipagePDF methods when open the fax documents. improved loading TIFF feature. Now the loading time will faster. improved OCR engine. Now OCR processing will more accurate when you call OCRStartScan or OCR2SearchablePDF or OCR2SearchableMultipagePDF methods. 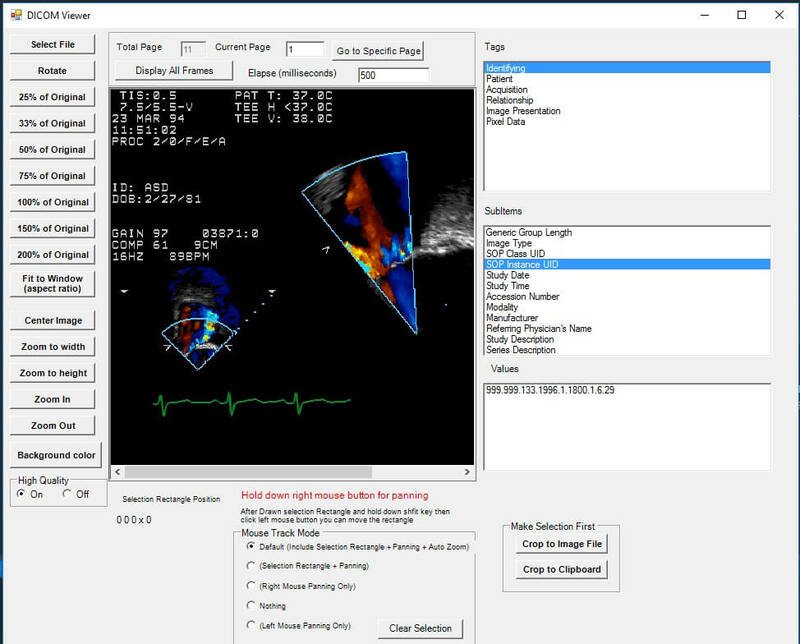 added DICOM plugin support display DICOM images, read all patient metadata from DICOM images. fixed draw a selection rectangle from center to upper left(make sure you go to 0 on top or left) , then Crop, Crop2Clipboard, Crop2HBITMAP, Crop2Image methods failed issue. fixed display multi-page TIF files, reset to the default zoom level issue, now it will set the same zoom level on the next page. 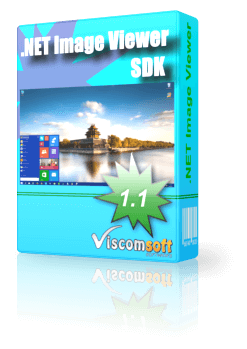 added DICOMDisplayAllFrame, DICOMDisplayAllFrameStartFrom, DICOMGetTagsSubItemName, DICOMGetTagsSubItemValue, DICOMGetTagsSubItemCount, DICOMGetTagsName, DICOMGetTagsCount, DICOMDisplayFrame, DICOMLoadImage, DICOMGetTotalPage methods. 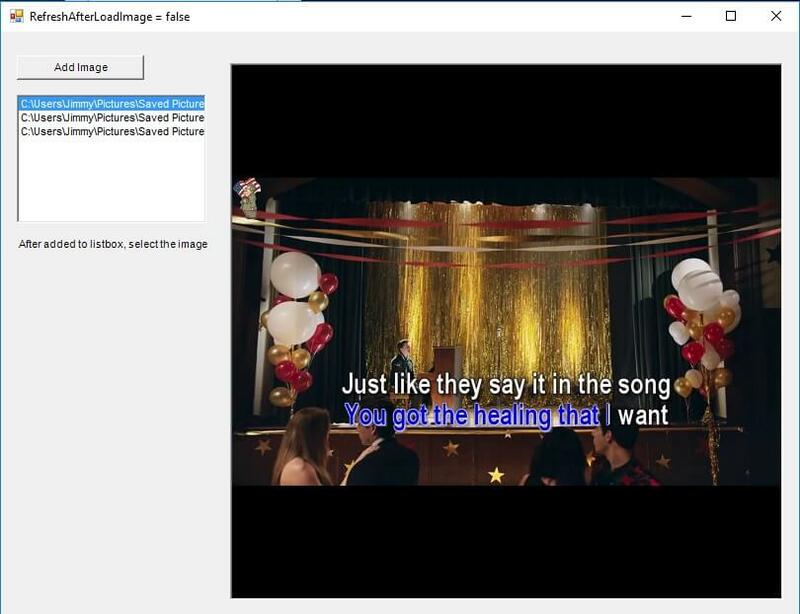 fixed allow open TIFF with JPEG compression (include wang annotations). added allow add barcode writer plugin generate Codabar, Codec 11, Code128A, Code128B, Code128C, Codec 3 of 9, Industrial 2 from 5, Interleave 2 from 5, Matrix 2 from 5, Code 128, EAN 8, EAN 13, Plessey, UPC-A, UPC-E Barcode. added allow set the alignment of text when call drawtext method. added allow draw image from HBITMAP handle. added DrawImageHBITMAP, DrawTextAlignment, DeleteBitmapHandle method. fixed open some tiff, report wrong page no.issue. fixed change view property , it have setfocus issue. 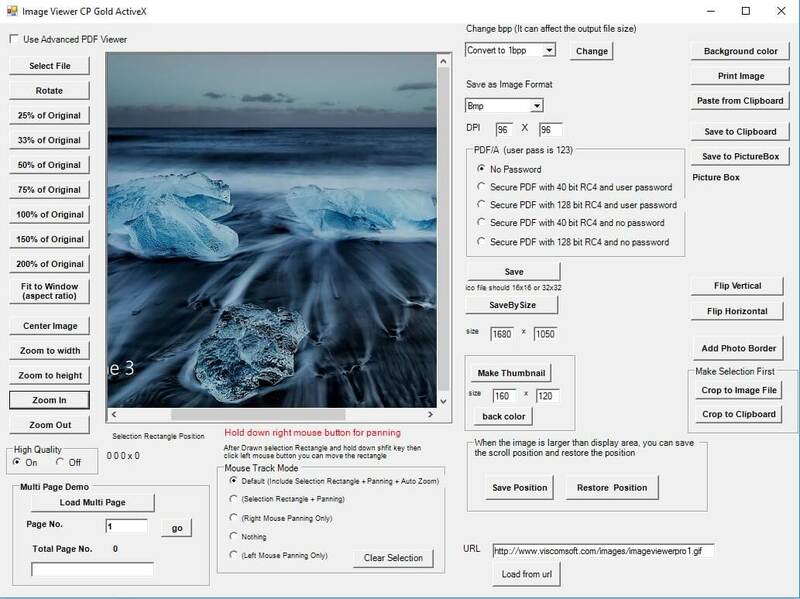 added allow use JPEG compression, adjust quality when save to PDF/A file with Save, SaveBySize, CreateThumbnail OCR2SearchablePDF and OCR2SearchableMultipagePDF methods ) . it can output small file size. added allow use Anti-Aliasing algorithm when call drawtext method. added allow accept drop file from window explorer. added draw overlay image with user define resolution,interpolation mode. added allow use Asynchronous Mode or Blocking Mode for OCRStartScan method. 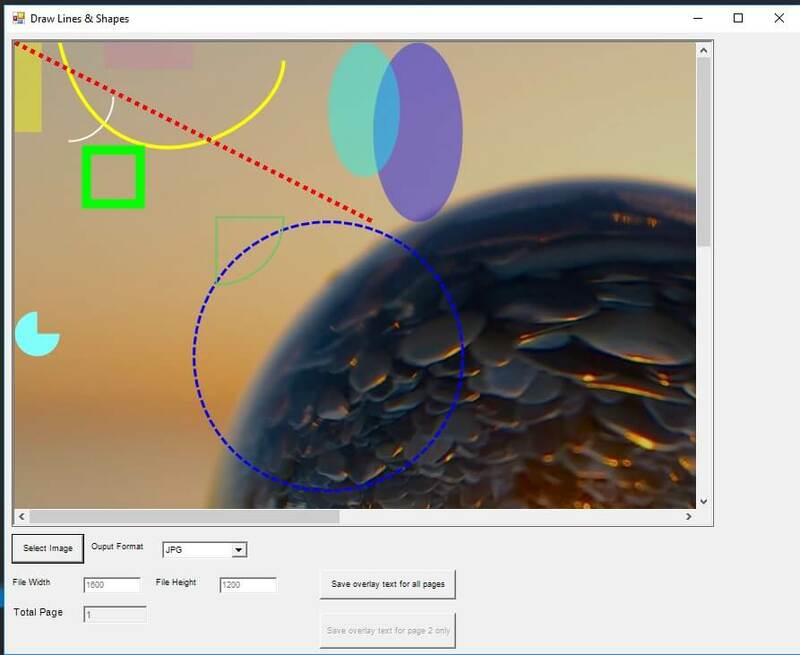 added DrawArc, DrawBezier, DrawEllipse, DrawFillEllipse, DrawFillPie, DrawFillRectangle, DrawLine, DrawPie, DrawRectangle, DrawTexturedLine, DrawImageEx methods. added rotate image at specific angle. added get the type of compression of TIFF file. added Export specific pages from multipage TIFF without decoding the TIFF. updated TIFMergeMultiFiles method that allow custom delimit substrings. fixed the refresh desktop issue when call Zoom to Width, Zoom to Height. updated OCR engine, the recognizing time will faster than old version 3 times when use OCRStartScan,OCR2SearchableMultipagePDF, OCR2SearchablePDF methods. added RotateAt, TIFExportPages, TIFGetCompressionInfo methods. added support PDF annotation when save to PDF/A file. added zoom method, it allow set x-axis scale factor and y-axis scale factor. added PDFLoadFromByteArray method, it allow load the PDF from Byte Array. fixed OCR2SearchableMultipagePDF method crash issue when input PDF file. added allow rotate multipage TIFF or PDF or rotate specific page no. added allow adjust the DPI when loading PDF file. It may improved the PDF quality when convert PDF to PDF file. added ClearRotateMultiPageOnly, RotateMultiPage, RotateMultiPageOnly methods. added barcode reader plug-in module. improved render pdf file and save to pdf quality. added Median filter for remove noise. added allow save to 1 bit, 4bit, 8bit, 24 bit TIFF with LZW compression. added when call CovertTo1bpp, CovertTo4bpp, CovertTo8bpp, CovertTo8bppGrayScale, CovertTo16bppRGB555, CovertTo16bppRGB565, CovertTo24bpp, CovertTo32bpp, CovertTo32bppARGB methods, it will affect the file size when output TIFF or PDF file. added draw overlay text or image can draw on specific page only. added BarCodeGetScore, BarCodeGetType, BarCodeGetValue, BarCodeReadByZone, BarCodeReadFullPage, ClearDrawPageOnly, DrawPageOnly, Median methods. added support securing a PDF document using 40 bit, 128 bit RC4 encryption and owner, user password. added support adjust standard PDF permissions. added PDFSetEncryption128bit, PDFSetEncryption40bit, PDFSetPassword methods. added allow change color resolution. added allow center the image. Set the view property to 12, it will center the image. added allow output searchable PDF/a file when use OCR Plug-In Module. added OCR2SearchableMultipagePDF, OCR2SearchablePDF methods with OCR Plug-In Module. improved PDF display engine, support PDF 1.4, 1.5, 1.6 or later. added loading PDF file with password protection. added return the PDF information when loading PDF file. PDFAuthor,PDFCreatedDate,PDFUserPassword,PDFOwnerPassword,PDFIsEncrypted, PDFModifiedDate, PDFProducer, PDFTitle, PDFVersion properties. added PDFExtractText method. It can extract text from PDF file. fixed the outputed PDF/A file ,can\'t open with adode reader issue. fixed when filename=\"\" unlock issue. improved Image2PDF method conversion speed. Now it will faster than old version. fixed when loading some TIFF crash issue. added Support Import/ Export Wang Annotation tags to text file. improved output GIF quality and allow set transparent color. added allow set color mode , print size, print copies, print orientation, print quality programatically when called PrintImage2Printer.